SQL Data Warehouse continues to provide a best in class price to performance offering, leading others in TPC-H and TPC-DS benchmarks based on independent testing. As a result, we are seeing customers, including more than 50 percent of Fortune 1000 enterprise such as Anheuser Busch InBev, Thomson Reuters, and ThyssenKrupp build new analytics solutions on Azure. With the launch of SQL Data Warehouse Gen2 in April 2018, customers have benefited tremendously from query performance and concurrency enhancements. To support our customers’ exponentially growing data volume and resulting analytics workloads, today we are sharing new SQL Data Warehouse features. Enhanced workload management, row-level security, and improved operational experiences. SQL Data Warehouse will offer workload management capabilities that optimize query execution to ensure that high-value work gets priority access to system resources. With features such as workload importance, customers can use a single SQL Data Warehouse database to more efficiently run multiple workloads, taking away the complexity of separate data warehouses for each solution. With this new capability, SQL Data Warehouse enables better control, utilization, and optimization over deployed resources. Workload importance will be available for all SQL Data Warehouse customers later this year at no additional cost. SQL Data Warehouse now supports native row-level security (RLS), enabling customers to implement the most stringent security policies for fine-grained access control. Going forward, customers will be able to change security policies without redesigning and redeploying of the data warehouse and there will be no impact to query performance when row-level security is applied. By implementing granular security directly in the database tier itself, and with native integration with Azure Active Directory, managing and controlling the overall security model is simplified via centralized security policy adjustments. Complimented by Virtual Network Service Endpoints, Threat Detection, Transparent Data Encryption, and compliance with more than 40 national, regional and industry-specific requirements, SQL Data Warehouse offers best in class security and compliance at zero additional cost. SQL Data Warehouse is committed to delivering first-class experience for data warehouse administrators and developers through improved insights and updated tooling to streamline automation and management. With the latest improvements, building a modern data warehouse on Azure just got faster and easier. Today we are sharing the preview of SQL Server Data Tool (SSDT) in Visual Studio for SQL Data Warehouse, offering first-class development experience with integrated support for version control, test automation with continuous integration, and one-click deployment of change scripts. This means that as business requirements evolve, data warehouse implementers can code and deploy enhancements faster, whilst still adhering to robust quality controls that block regressions from creeping into production systems. We are also extending the intelligent insights capability to include additional details for database schema optimization that recommends optimal use of replicated tables as well as well utilization of Adaptive Cache and TempDB. With a built-in holistic management experience through Azure Advisor and Azure Monitor integration, data warehouse administrators can seamlessly uncover performance insights and easily tune the solution for better performance. Query Store has been an incredibly popular feature within SQL Server that enables developers to troubleshoot query performance issues relative to historical execution time. We’re pleased to now bring this capability to SQL Data Warehouse. With Query Store, developers can review query workloads running on the platform, and analyze associated query plans and runtime statistics to identify any performance issues that may impede productivity. To keep your data warehouses fresh and up to date with data source changes, supporting updates and transactions is critical. However, interrupting long-running transactions can sometimes lead to longer database recovery processes. To improve database availability, SQL Data Warehouse now incorporates Accelerated Database Recovery (ADR) feature. With ADR, SQL Data Warehouse improves database availability and enables much quicker pause and resume service operations. For advanced troubleshooting scenarios, SQL Data Warehouse now provides one-click integration with Azure Monitor Diagnostic Logs that enables developers to capture and archive usage data such as queries executed and wait stats for future analysis. These logs are a natural extension of the existing dynamic management view capabilities in SQL Data Warehouse and developers will benefit from the familiar and powerful experience. With its native integration with Azure Databricks, Azure Data Factory, and Power BI, SQL Data Warehouse allows customers to build new analytics solutions to support modern data warehousing, advanced analytics, and real-time analytics scenarios. 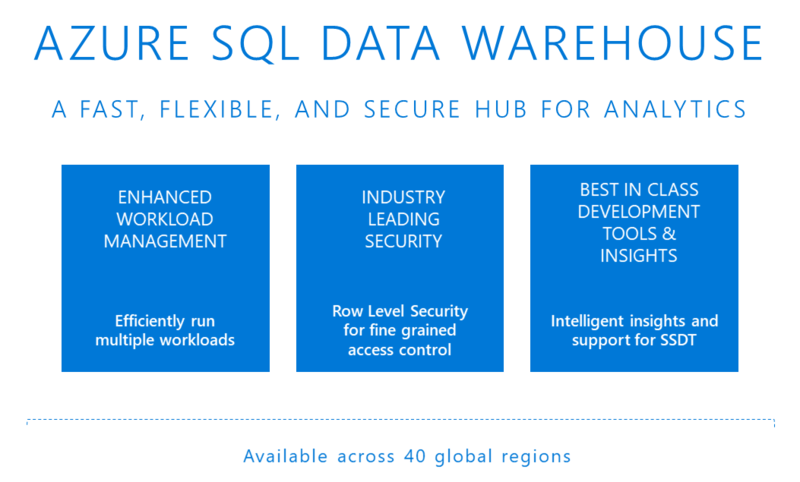 A key feature new capability is SQL Data Warehouse’s native integration with Azure Data lake Storage Gen2 the only cloud scale data lake designed specifically for mission-critical analytics and AI workload. Customers can also leverage 25 plus Microsoft and third-party data integration and BI tools to build an analytics solution for any enterprise. We have partnered with vendors to streamline the modernization of legacy on-premises data warehouse to Azure. These ecosystem investments allow our customers to build upon their existing infrastructure and significantly accelerate time to value for powerful analytics solutions. Join us at the PASS Summit this week in Seattle to see the Azure SQL Data Warehouse innovations live. Experience the performance of Azure SQL Data Warehouse by creating your first data warehouse. Contact Microsoft for a free data warehouse modernization assessment.